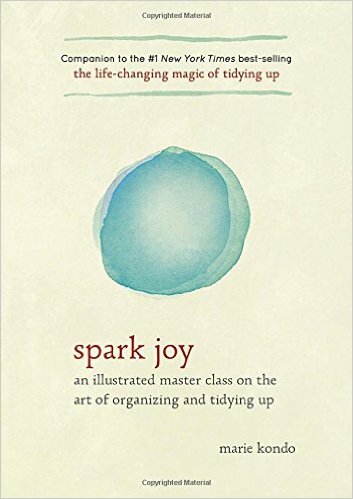 After enjoying her first book 'The Life Changing Magic of Tidying Up', I was excited to read this follow up book. I was wondering if this is just going to be repetitive and worth getting, but I went ahead and got it anyway, and really enjoyed it. While it does seem a little bit padded out, (i.e. just over explaining things already covered in the first book with examples) there are some real treasures of inspiration within this book that are not in the first one. She gives more clarification on techniques along with illustrations. In particular I liked the detailed sections on how to arrange closets, exactly how you fold different items, from tops, dresses, skirts to underwear to bags. She also goes into more detail with how to arrange things in the bathroom, kitchen, what to do with miscellaneous stuff. Packing a suitcase efficiently also gets its place in there. 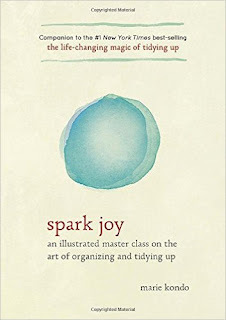 I love the positive way she approaches tidying - it is very refreshing and inspiring and appeals to my desire for everything to look beautiful. I think it is a dream for most housewives for their home to be beautiful and clean - with lovely table linens etc. I agree with her, it makes you feel so much better to look around at pretty things or things that bring you joy. She goes to lengths of even removing labels from her laundry detergent bottles or covering with a big bow so it looks nice. Thought it was an interesting thought about the words too - if you have too many books and words in a room it is like they are constantly speaking and creating a noise in the room. That people that remove them or cover them up, find the room is more peaceful after. On the whole I would recommend this book. I really enjoyed it and found it really inspiring and energizing. Marie is so passionate about this and it passes on to her readers.